Mutt: So the 54 KHRM doesn't come with a kickstand ? (can't see it on the brochure) What are those shocks covered with? Why not!!! 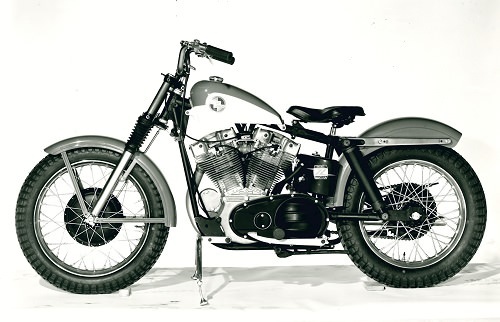 Maybe all the 260 or so 1958 XLCs had XLR engines, race frames and taped up side stands!!! As for the shocks, I thought for a long time these were leather covers, but no, they are rubber covers. I think that the engine is a '57 see the space between the number pad and the bar below it 10 screw primary grasshoppers on an R? Morality: don't believe the factory photos too much!!! And moreover, don't use them to justify your choice of restoration!!! I just realized from looking at the pictures simon and patrick posted, that both bikes have the big twin side stand mounted half on the skid plate and half on that steel frame that supports the brake lever. Most of the other pictures of "restored" KHRMs have the side stand mounted on the left front motor mount ... but most of them are alo missing the KHRM brake leverage. Still, the brake lever support that simon posted pictures from in an earlier post does not have the tabs to mount the sidestand and it does not look like they have been removed? Was the side stand included, when the bike was handed over to the customer? Another thing that I really like is the number plate mount, which seems to prove that the KHRM was "street legal" in the US at that period of time. Last edited by thefrenchowl on Thu Mar 01, 2018 12:32 pm, edited 3 times in total. I fully agree with you, unfortunately to many originals are parted out for "restaurations" that are made of parts with unknown history. Lucky people had access to these juwels 20 years ago and took the chance. Today it gets almost impossible to own an "original" as there are always people with a bigger purse ... but thats another topic. 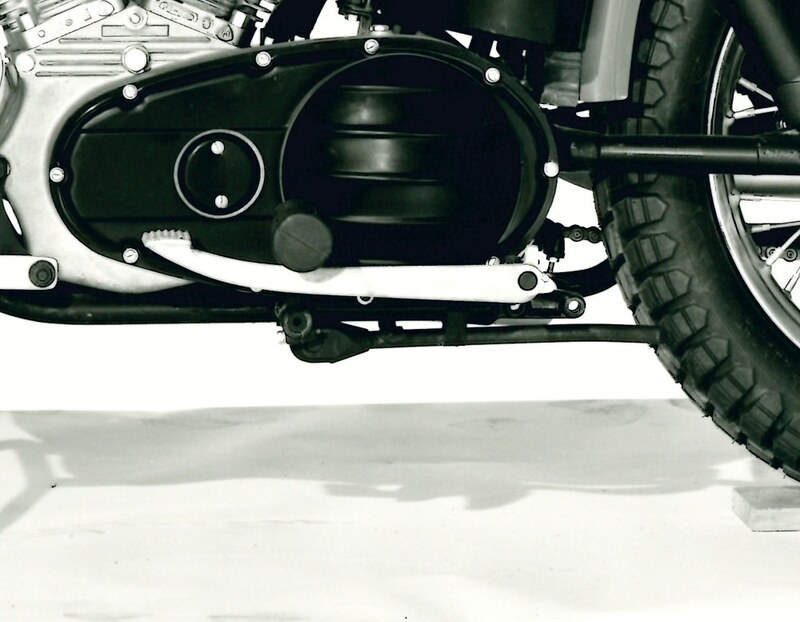 I was always wondering about the use of this tube on the foot peg/brake lever support. Now it makes completely sense -- its there to hold the side stand! If the left peg was just held by the flat bar held by 2 bolts on the frame/primary, it would have bent at the 1st encountered rut!!! That it holds the jiffy stand is like a lucky afterthought!!! Patrick I remember you and that blue KHRM - so it’s the same bike? The one that got away! Owner of that yellow bike was looking at about 20K.He said it was as delivered and the owner had it from new but I still suspect some parts were changed out. My KHRM rear fender does not have the number plate mount. I suspect these were very custom orders at the time. Here are some pics I have of the KRM/KHRM speedo and what I believe is the drive.